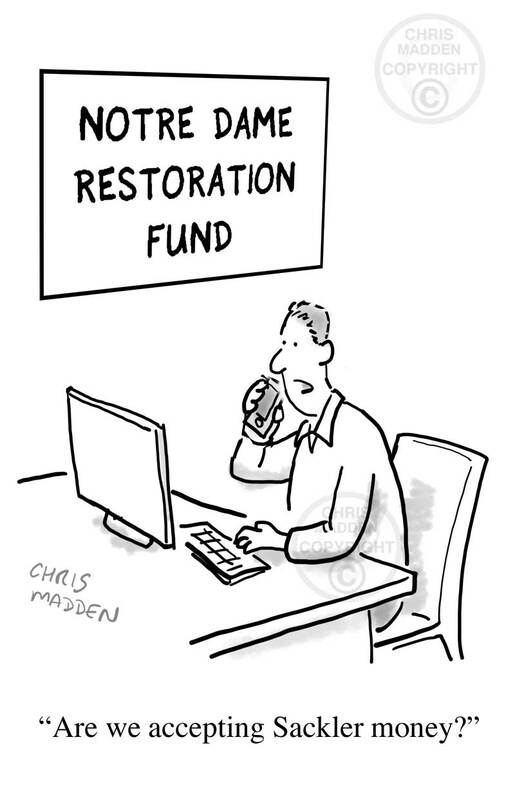 Notre-Dame fire restoration fund/Sackler boycott cartoon. This is a cartoon that deliberately links two current news stories: the restoration of Notre-Dame cathedral following the devastating fire and the boycotting of funding from the Sackler family charitable trusts. The cartoon was drawn on the evening of the fire, and predates the controversy about the donations from large businesses that developed in the following days. The cartoon is primarily about the current controversy in some western societies concerning the assumed ethical standards of the donors who contribute funds to institutions such as art galleries and religious buildings. The Sackler family are major benefactors to many institutions. Only a week ago I was in Westminster Abbey in London where I noticed their name on a recently restored stained glass window to which I assume they had contributed funding. However, the Sackler family own Purdue Pharma, a company that produces the prescription painkiller OxyContin that is said to be addictive. Thus there are calls to boycott any charitable funding offered by the Sackler family. Of course the Sackler family are far from being the only donors to charitable causes who may be involved in supposedly tainted money. It could possibly be argued that any organisation that had enough money to distribute in such lavish ways must have come about it by somewhat dubious means, depending on one’s standards. A cartoon about money laundering leaks, tax evasion, tax avoidance, tax havens. 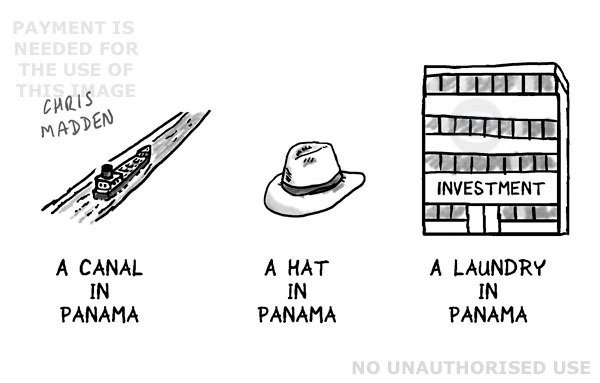 A cartoon about tax evasion, tax avoidance, tax havens, Panama, money laundering, leaks. A joke showing people being deceived by a special offer in a shop. 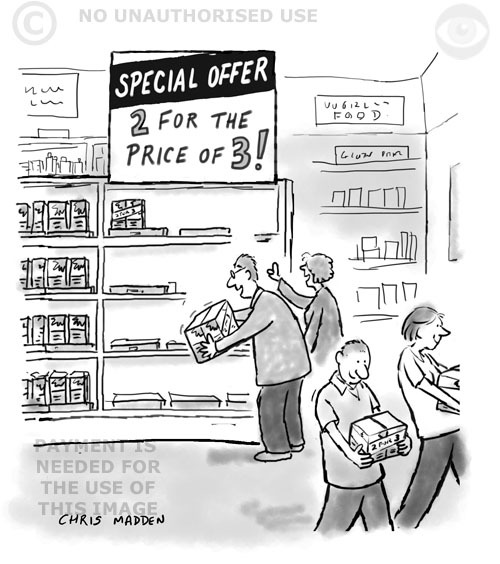 The customers see a sign with the special offer of “Two for the price of Three’ and they automatically think that this is a good deal due to the way that the offer is framed (interpreting it in the same way as “Two for the price of three”). A cartoon about marketing, persuasion, selling, manipulation, misleading offers. How to ignore inconvenient truths. A TV viewer wanting to ignore the evidence in a television programme as it would make him uncomfortable. A cartoon depicting a person ignoring an inconvenient truth. 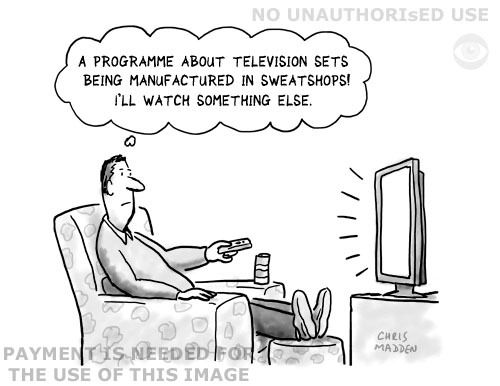 (The cartoon doesn’t actually imply that all televisions are manufactured in exploitative sweatshop conditions – the use of a tv in the cartoon is because the tv in the image is, ironically, the conduit for the information to be made available). Factory workers in the developing world manufacturing consumer goods for the west, and being exploited. 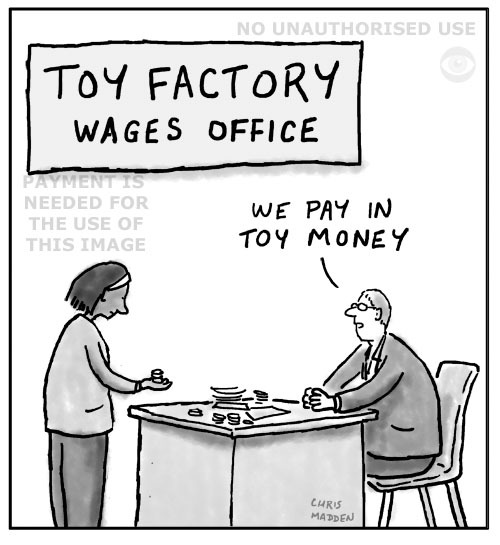 The cartoon shows a worker in a toy factory being paid with toy money. Factory workers in the developing world may actually be paid at a fare wage in terms of the local economy, however there is a complex dynamic of exploitation at work, involving working conditions, safety levels, working hours and more. Showing a banking job interview. 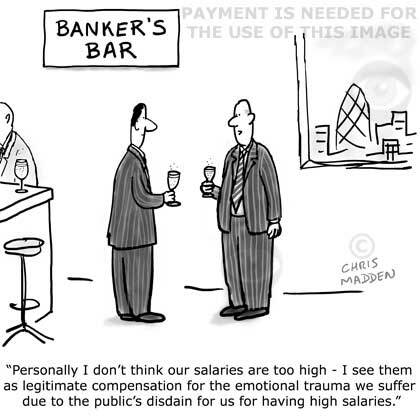 The joke in the cartoon is the tautology or circularity in the justification by the banker of his high salary. 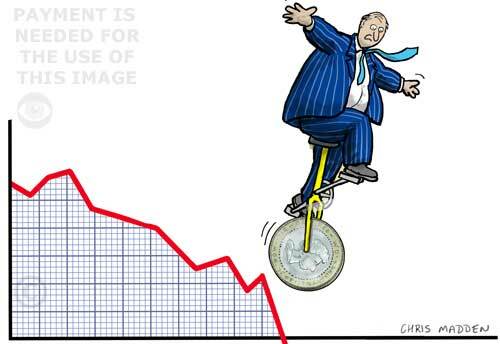 A cartoon about finance and economic matters, showing a graph with a banker, businessman or entrepreneur balancing on a unicycle on the graph. The wheel is a coin, symbolising money and financial issues. The image shows a bank customer withdrawing money from a cashpoint (ATM) and tentacles coming out of the cashpoint to engulf her. Grillo is now possibly in the position of being a ‘king maker’. 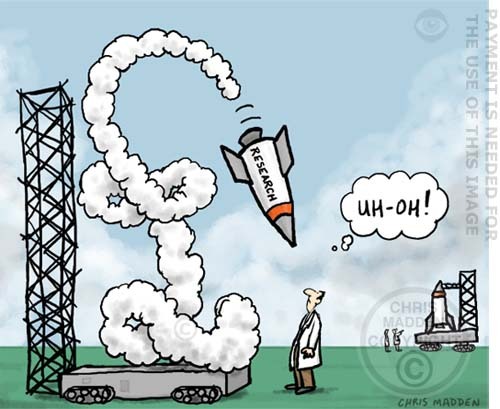 A cartoon showing a rocket, labelled ‘Research’ being launched and then stalling after lift off. 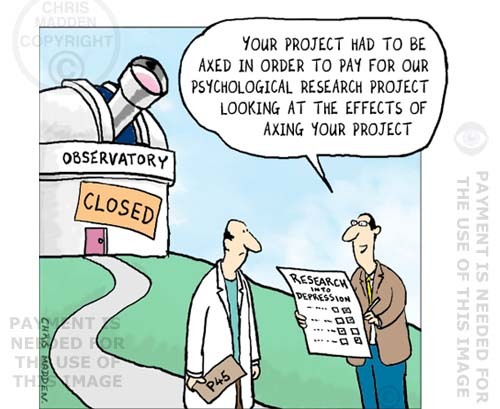 A cartoon to illustrate articles about cuts in budgets for scientific research. The cartoon shows research funding going to a research project that monitors the effects of the cuts in research funding. The cartoon shows an astronomical observatory that has been closed down due to lack of finance. Cartoon showing a bar code in the shape of a city’s financial sector. 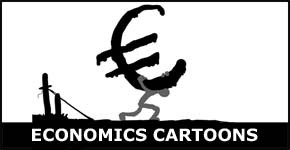 To see my economics cartoons, including cartoons about the euro crisis, please click the image on the right, or click economics cartoons here. A cartoon about the US economy and the weakness of the dollar – showing a dollar sign as a link in a chain. The dollar sign is the weakest link in the chain. The image is also about the fiscal cliff threatening the US economy in the new year of 2013, possibly making the US economy fall into recession. A cartoon about the US economy and the weakness of the dollar – showing it as a weak link in a chain. The cartoon is also about the fiscal cliff threatening the US economy in the new year of 2013, possibly making the US economy fall into recession. A cartoon about the fiscal cliff that is threatening the US economy, possibly making the US economy fall into recession. A company logo featuring the earth. The company motto is being discussed. Should it be “One World” or “All ours”? A downward graph with a euro coin bouncing down the slope of the graph during the euro financial crisis. An illustration of the global recession. An editorial illustration about finance, and the eurozone financial crisis. Editorial illustration about financial recession – downward graph with a globe bouncing down the slope of the graph. An illustration about the world financial crisis. The accompanying page design is a suggestion of how the image could be used. A financial cartoon about the Italian economy and the European monitory system. A financial cartoon about the economic viability of the European monitory system. An editorial illustration about the euro bailout fund and the eurozone debt crisis. 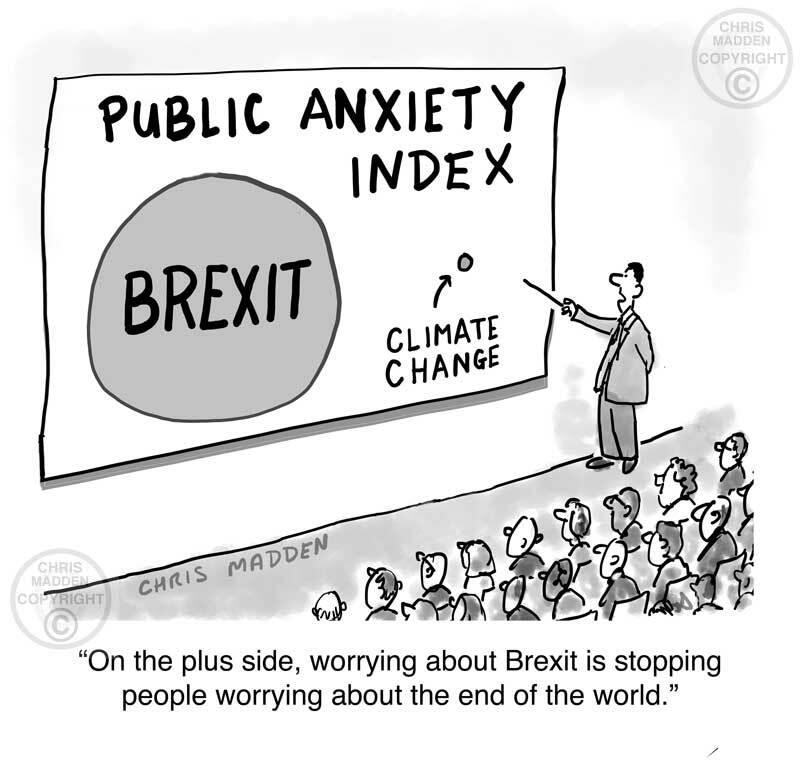 A political cartoon or financial cartoon about the economy, the eurozone debt crisis, the debt in the euro zone, European monitory system. An editorial illustration about the eurozone debt crisis. Editorial illustration about the euro crisis and the European monitory system, showing the euro sign as a huge weight. Euro crisis cartoon. The euro symbol as a broken harp. Cartoon about the scandal of banks rigging the libor rates to their own advantage. Barclays Bank accused of “systematic dishonesty”. Cartoon showing a job interview in a bank. On the wall of the bank is a gigantic picture of a dollar sign. Showing a banker as a thief, robbing from the public (or elsewhere). The illustration represents a banker’s attitude to the public (The manipulation of the libor rate to the bank’s advantage meant that many customers had to pay more for their mortgages amongst other things). The joke is that the robber is running into the bank, whereas usually robbers are running out of banks. Barclays Bank interest rate rigging cartoon. An illustration about the scandal of Barclays Bank and other banks rigging the libor rates to their own advantage. Showing a Barclays Bank logo defecating on the head of a customer. The cartoon represents Barclays Bank’s attitude to its customers (The manipulation of the libor rate to the bank’s advantage meant that many customers had to pay more for their mortgages amongst other things). Did Bob Diamond know about the practice of rigging the libor rate? The scandal of traders at Barclays Bank and other banks manipulating the libor rates to their own advantage. Did Bob Diamond know about the practice? Cartoon about the Euro crisis in Spain. Cartoon about the financial crisis in Spain, showing the fact that the bank Bankia needs propping up. The joke in the cartoon is that the building that houses the headquarters of the Bankia bank is of an unusual architectural design, appearing to lean over dramatically. The cartoon shows a person taking a photograph of another person who is standing so that in the photo he looks as though he is propping up the tower that is the hq of Bankia. This is a direct reference to what tourists do when they are standing near to the Leaning Tower of Pisa. As well as being a straightforward joke about the leaning tower, the cartoon also has the more serious underlying point in that it asks whether the support given to Bankia will be effective, and whether the effectiveness in holding back the possible collapse of the euro currency will be illusory (shown by the illusion of the man holding up the bank in the photo). A cartoon about the euro crisis, bank bailouts, struggling economy, banking debt.